DP called me up this morning around 9:30 and hinted that it looked like the rain was going to miss us for a couple of hours so I took the bait and said lets go. I invited Greg then went out and filled the bait tank with water. 25 minutes later we were on the way to the lake. We had a short window to fish in, it was going to start raining hard around 2 and Ethan had to get back early for a practice this afternoon. Bait was tough, after a couple of hours we took what we had and put them out. All we really wanted to do is get out of the house and see the kids reel in a couple of fish. Ethan's first Striper was the first one to hit and he did a fine job of getting it into the boat. We popped a picture of it then Anthony hooked up and showed Ethan how a pro reels in a Striper. They traded turns reeling in fish for about an hour and a half till a nice fish hit our outer board. DP thought we were hung up but when he picked the rod up the fish tried to pull it out of his hands. He hollered for Ethan to come grab the rod but when DP handed it to him there was no way Ethan could hold the rod much less turn the handle. DP passed the rod to Greg and he wrestled the fish to the boat where we netted it. I put it on the scale and it was a little over 16 pounds. The fish was in very good shape so we released it along with all the other fish we caught with the exception of the four fish the kids are holding. We all are having Striper for dinner and released enough fish for dinner for 20 if someone can catch them again. 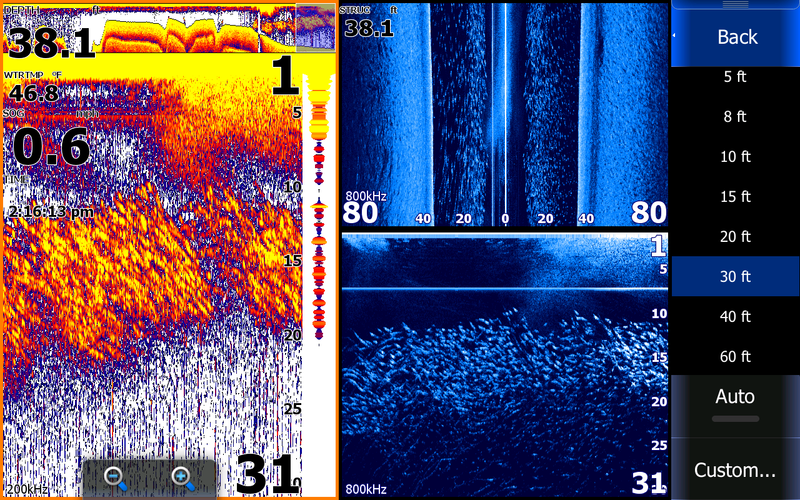 This is a picture of Gizzard Shad in the water column between 10 and 25 feet deep. You can see on the upper left screen that I had been marking it for quite some time. We caught no fish in the bait but about 30 yards outside the bait we started hooking up. This is a shot where we caught Stripers shallow on planner boards. This was early in the morning after a warming trend nearby rocks and boulders. We were hooked up with 3 at a time when I took this picture. 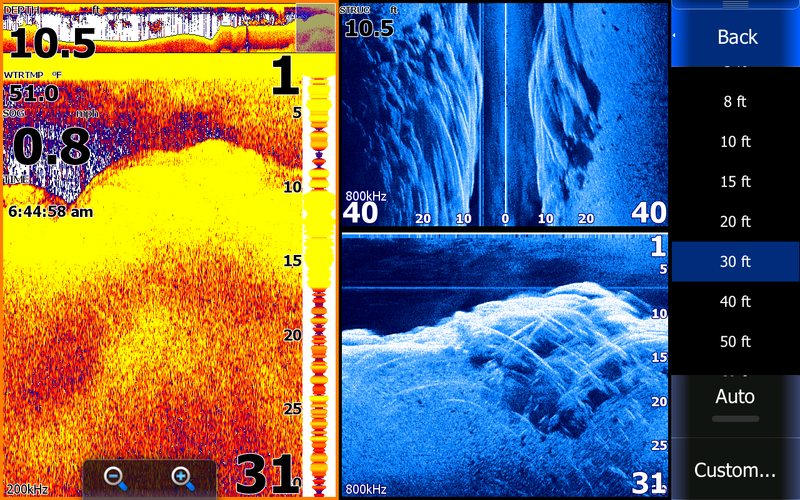 The sonar side shows what appears to be just bait but the structure scan shows Stripers hovering over a rock pile. Here is a shot of me dropping down a downline with a sinker and a 5 inch bait. You can easily see the sinker and bait descending then I engaged the reel at 34 feet. Within 15 seconds a 12 pound Striper hit the bait and the fight was on. A couple other fish streaked off the bottom to watch the fight. 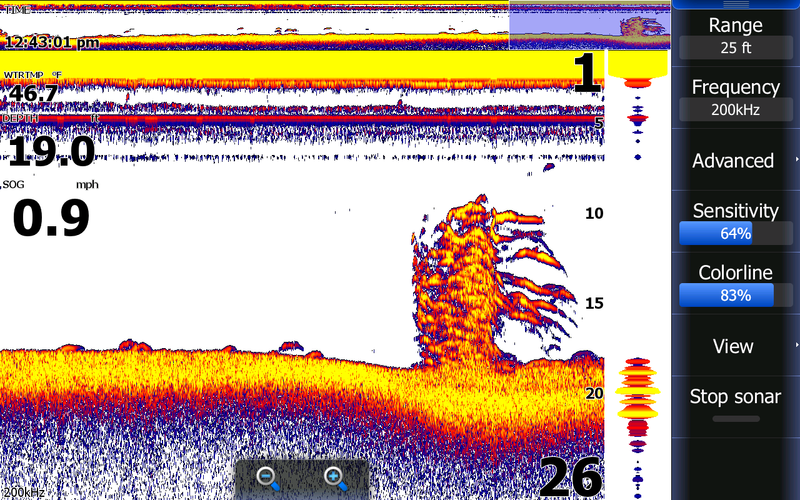 This is a brush pile in 19 foot of water that has bait on the left side of it and fish on the other. We hooked up with a 22 inch Striper and a 16 inch Crappie over this structure. 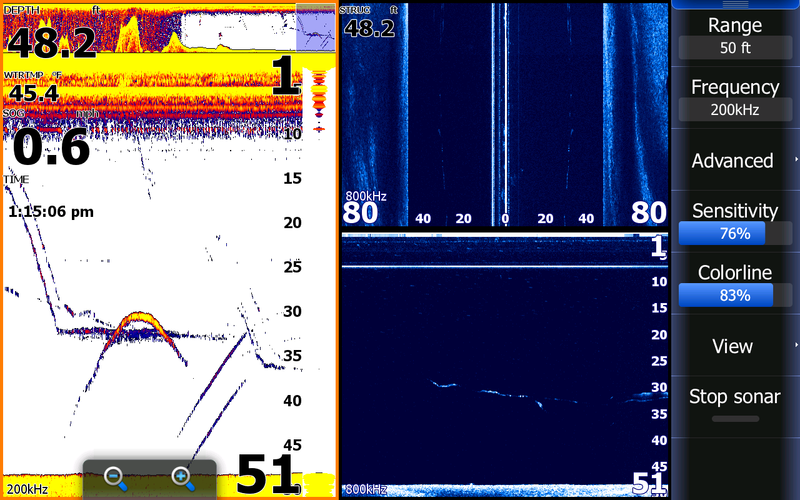 The brush was definitely holding fish but I did not turn back to investigate what kind we were seeing on the Lowrance. What a difference a day makes....Yesterday 75* and beautiful, today 30's and cold. The weather did not dampen these guys spirits too much today. They enjoyed reeling in these and other Stripers this morning. Tristen caught the big fish of the day which was right up on the bank. We took numerous hits today but seemed to hook up with only about half of our strikes. I think everyone is ready for Spring, Old Man Winter need to call it quits and let the water warm up. John wanted to treat his grandsons to an enjoyable time on their spring break so he brought them down from Massachusetts to see the sights in Washington and to spend a few days out on the water catching fish. This was not the best week to fish as far as weather is concerned but these were some tough guys that are use to cold weather. The top two pictures were taken on Wednesday. The weather could have not been any worse. The temps never got out of the 30's and it rained the whole time we were out there. To make matters worse bait collection took 4 to 5 hours to catch the kind of bait we needed. They hung in there and boated some nice Stripers. Luke is holding a Striper over 14 pounds, the largest of the trip. These young men were excellent listeners and boated everything that got hooked up. The weather slowed fishing up this week due to the water temperature dropping 4 degrees since the weekend. We never had any times when they were here when we would hook up with numerous fish, very uncommon for this time of year. If the weather would straighten out and warm up a little these Stripers on the lake will turn on and fishing will be excellent due to the hard winter and bait kills we experienced. Look for some incredible stringers in the upcoming weeks! Luke and Tom will have some good memories of their Spring vacation. Guide Brian took these fishermen out for a afternoon of catching Stripers on Lake Anna earlier this week. The bite was definitely on because in a short time they boated about 20 Stripers. These are some very nice fish the guys are holding. Its time to book your trips, we have been constantly catching good stringers of Stripers and the fishing and weather is only going to improve. We are running 2 fully rigged 22' boats that capable of handling 6 anglers fishing up to 18 rods at once rigged with the natural live bait the Stripers feed on daily. Its been a long winter, call [540 967 3313] or email [Jim_Hemby@hotmail.com] to reserve a day on the water with myself or one of our 4 excellent guides. Today I got out early and hung a light, picked the guys up at 6:30, caught bait and went fishing. All I did was look for a place where there was no boats and set out a spread. I told the guys that with the extreme weather change we were just going to pull baits till we found the fish and that is exactly what we did. I fully expected to have 40 hits today and catch 30 fish but it just never happened. We took about 25 hits and caught 16. Although the fishing was not what I expected the weather was incredible today. Good things never last and by the looks of things the weather is going to change big time. The guys had a good day on the water and had plenty of fish to take home today. This morning we picked up our clients and filled the bait tank up quickly. We set out a spread of boards trying to put a pattern together but we would catch a fish over the channel, then one in the mouth of a creek, then one up on the bank, never any serious bite but we hung in there and caught a stringer full of fish. The highlight of the day was when we boated two Stripers on one rod. Hopefully tomorrow the fish cooperate a little better so we can catch some larger fish. This is a weekend Josh has been waiting for for a long time. He called me many weeks ago about renting a house on the lake and fishing a couple days to celebrate his BACHELOR PARTY. The day finally arrived and although the weather sucked for fishing he was pumped to go so I got up early and caught bait then waited for them to arrive from Md. I picked them up at their dock around 9:30 and we looked for a place where we could get out of the wind but there was no such place. I set up in an area where the waves were white-capping and as I was showing them how to deploy the baits we got hit. We got that fish on board then I showed them again how to put the baits out but before I could bait another rod it hooked up as well. It was extremely windy and very cold so it didn't take long for the guys to get cold today. I made a move after about an hour and that is when Josh hooked up with these two nice Largemouth. He reeled in a fish that was hooked up on a board and tangled with another line on the board that was in front of his. There must have been another bass following the hooked up Bass and it hit the bait that was tangled in his line. When he got it to the boat I netted them both in the picture above. Although the weather was so poor and we only fished a few hours they had a great time today. I got them back to their house early so they could get ready for the festivities this evening. We are scheduled to go out in the morning but I believe it will be a late start again. I will bring some Advil for them tomorrow. Today we caught bait early this morning then picked up our crew about 6:45. This morning was post-frontal and I thought the bite would probably be hindered by the approaching cold front. Yesterday morning Guide Anthony fished boards getting plenty of hits and pull backs but not many hook ups so I decided to try something completely different. I ran downlines on breaklines and started to boat fish. Anthony was out again today pulling boards so if the board bite got going he would let me know then I would convert over which we did. The front definitely affected the bite today, we would see little fish on the Lowrance and never got into any good feeding opportunities. The highlight of the day was Bobby's 22" 7 1/4 pound Largemouth Bass. We boated about a dozen Stripers and 3 Largemouth.